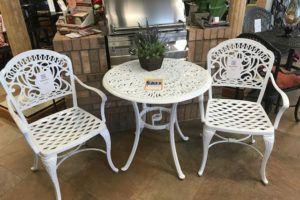 You are here: Home / Tutorials / Why Powder Coat Your Patio Furniture? Why Powder Coat Your Patio Furniture? If you are investing in your patio furniture by buying quality, you want to make sure that investment lasts for as long as you can make it last. 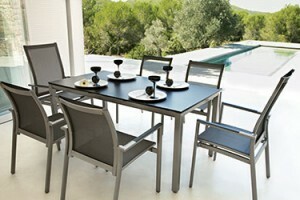 You want durable furniture that you will not have to look after too much. 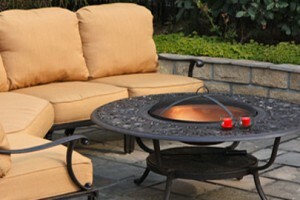 One of the ways to make sure that you get the most out of your furniture is to powder coat your patio furniture. This has a number of different benefits that we are going to tell you about. First, what is powder coating? Before we get ahead of ourselves, we should start with what powder coating actually is. Powder coating is a process of applying a protective and decorative finish to a number of materials. A dry mixture of pigments, fillers, and resins are electrostatically applied to metal objects. The object is then heated so the powder melts and fuses on the exterior of the object. This is almost like a ‘skin’ for the patio furniture. How is this different from traditional paint? Tear free in strips when dented or scratched. If you want a precise finish and pattern, powder coating is the way to go. You have an unmatched ability to mix and match when you are working with powder coated patio furniture. 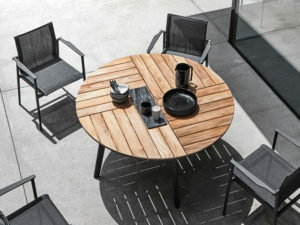 You want patio furniture that you can use throughout the year, but you don’t want to have to take it indoors or think about it every time some rain comes along. Powder coating is going to keep your furniture protected, regardless of the type of weather or the type of temperature that it is exposed to. Whether you expose it to pounding rain or unrelenting sun, power coating is going to be tough enough to deal with it. When you have it professional done, you can enjoy powder coating for upwards of twenty years before you have to think about a change. We understand that everyone is different, so we get that you might have a funky color scheme that no one else does. Regardless of the color scheme of your patio, powder coating can match it. Not only is powder coating going to hold onto its shine for a long time, but it is also available in a broad spectrum of colors. While not necessarily important to everyone, powder coating does not contain those harsh chemical solvents that are included in conventional paints. This makes powder coating a more environmentally-friendly option. You can also recycle coating and put it to future use if you have anything left over.